I thought it’d be a good idea to get the kid out of the city for a bit, but he fidgeted in my car and looked at me with pain in his eyes, like the further I took him from the city’s grime, the further he was away from fuel. More than once, I worried that his lungs were blackened from his proximity to the grime on the floor of the city, but it seemed like he might gain his power from it. He has this effortless cool that pours out of him like molten stainless steel carefully coaxed into ice cube molds; but his veneer shook loose as we stretched miles from the city. “What are you worried about?” I ask. Getting the permit to take the kid to the beach was a farce of neverending paperwork – it took seventeen forms with seventeen of my signatures at the bottom of them to get him out of his foster house, and it was going to take a further five pages of reports and signatures to put him back in his house. I want pictures and memories to show for it – a sunny day where, maybe, he rides on the back of a turtle or an aging surfer teaches him the ways of the surf and the board. The kid fidgets and plays with the fray of his seatbelt. “Let’s play twenty questions,” I say. “I’m always thinking about something,” he says, looking out his window. We had been paired by a computer after I was sitting in a cafe with an internet connection and I was tired of clicking through the websites I usually clicked through when I sat in cafes with an internet connection with little to do. I clicked on an ad from a blog I like that promised a feeling of good in what was essentially the San Diego area’s answer to Big Brothers Big Sisters, which they called, “Your New Mentor.” I felt a surfeit of time on my hands with few good deeds to show for it. I signed up and went through a process that was obviously set up to weed out the weirdos and the computer put me with Noel, the quiet kid who kept getting bored with my line of questioning and telling me exactly what he was thinking. We would usually hang out on Saturday afternoons, sometimes Wednesday evenings too. 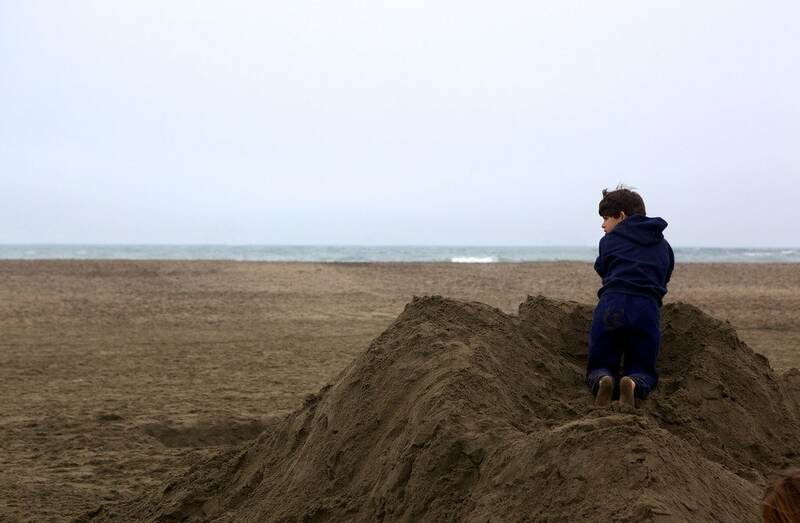 I would take him to the park and would buy him ice cream (against Your New Mentor rules) and then I would watch from a bench while he dug himself sand perches with other kids his age. He would sit on the top of the perch and then he would look down at me on my bench and he would wave, and usually that was about time to go home. That was Saturday afternoons. Wednesday evenings we would go to a bookstore with a table and I would watch him do his homework. The first thing I noticed about Noel was he wore his younger brother’s jeans (his foster brother, not his real brother) who was a big enough little kid that the pants fit Noel around the waist, but his socks would always show. Even after eight months, or 45 hangouts, I do not feel like I am at a place in my relationship with Noel that I can ask why he wears his little brother’s pants. When we get to the beach it’s a cold day and the tide is out and the surf is bad, so we have the beach to ourselves and I don’t really know what to do. The car smells sickeningly of the coconut suntan lotion I slatehered on our exposed arms and necks and noses, and I can tell that he wishes I hadn’t done any of this. We get out and sit on the hood of the car and I try to think of a way to apologize, but then he lies back and breathes in and licks his lips. “I can taste the salt here,” he says. He goes to the sand and immediately starts pushing the sand with his hands, and eventually I get down and help him. “Do you ever think there will be robot dogs?” he asks suddenly. We take all day to make a perch that makes Noel happy and I go back to the car to get my camera when a girl comes by and waves to me and talks to Noel up on his perch. The wind carries her voice away from me, and she jogs away before I can talk to her. He’s all smiles. He doesn’t answer, he just gets back in the car. “I like the beach,” he says, pulling on his seatbelt. It’s the most he’s ever said to me. I wonder what my Dad felt like when I said things to him that he wanted to know. Posted on Sunday January 30th, 2011 Wednesday March 26th, 2014 by Max Elman. This entry was posted in Photos & Stories and tagged beach, brother, family, foster, relationships, sand. Bookmark the permalink. I might take a lesson from this kid and never wear my own pants outside again.